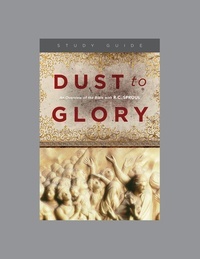 Save more when you purchase five or ten copies of the Dust to Glory study guide. One morning when I could not sleep; I got up and found RC Sproul at 3:30am doing his program on NRB Network. I loved it! I loved RC and found myself recording his series which was soon to be "Dust to Glory"! I was so happy that I found this early morning show that I could use to base my day on--Truth, Biblical Truth; that I now use to begin each new day. This sets the pace for each new morning--thank you, RC Sproul and Ligonier Ministries. I'm from South Africa and I recently got my hands on some of Dr. Sproul's teachings and I have to say that I am thoroughly blessed by his indept understanding of the Bible. His teachings has impacted my life in a very significant way and I am forever grateful. Thank you RC. I do not intend to demean a year spent at Bible College, but as far as knowledge and understanding, Dust To Glory pulled it all together for me so I passed a written exam in lieu of Bible College. The requirements for my teaching credential and to be a chapter Director was either the schooling or pass an exam considered equivilent. I passed the exam with high marks. I credit my two times through the Dust to Glory with pulling together years of knowledge and study. Thank you, Brother R.C. Fantastic Survey of the Bible! I only regret I was not exposed to this excellent overview as a young Christian. Dust to Glory was and is any eye opening experience. R.C. Sproul's love for God and The Bible is generated through these teachings. After this experience I have never seen the bible and God the same. Through this series as well as another series by Dr. Sproul entitled Defending Your Faith, I have grown in my deep appreciation for Dr. Sproul's exposition of Scripture. I recommend it to anyone seeking to know God and His Word better. Leon Stansfield, M.Ed., M.Div.